One of the most obvious principles of liberal democracy is that those who are most affected by the decisions of elected governing authorities be the most consulted on the decisions in question. The right to be consulted does not equate to a right to a veto, only to be heard or considered in an objective analysis as to which course of action will maximize the greatest good for the greatest number. A democracy that maximizes this kind of consultation may be properly considered to be a Participatory Democracy. Various Green Parties in Canada and elsewhere were founded with Participatory Democracy as one of their six stated values, alongside Sustainability, Non-Violence, Social Justice, Ecological Wisdom, and Respect for Diversity. Unfortunately however, the value of Participatory Democracy has been one of the declared values that the Green Party of Ontario has most failed to abide itself by. I know this from personal experience. In July 2017 I was present at the Green Party of Ontario Guelph Nomination Meeting for the Leader Mike Schreiner. In casual conversation afterwards the Leader asked me at his own initiative, “Are you going to be a candidate?” Schreiner was aware that I had been the 2015 federal Green candidate for my home riding of Renfrew-Nipissing-Pembroke. After careful consideration and inspiration from the GPO, the following October I applied to become the Green candidate for the same riding. On November 23rd, the Provincial Nominations Committee approved me as a Nomination Contestant. I waited patiently for updates as months went by, but kept being stalled with vague deadlines and non-information. In the meantime I was made to feel supported with training opportunities provided by the party in Guelph, Ottawa, and in webinars. Then on April 13th, after assurances that nominations were closing and without anyone else having yet applied to become the Candidate, the Nominations Committee and Executive Director abruptly slammed the door in my face on my candidacy prospect. No supporting details were offered. I needed an explanation that I could give to my hundreds of constituents who were expecting my Green candidacy, as all public hints prior to April 13th were that there was no outstanding objections or competition to my candidacy and so many citizens were confused. I wanted to give an explanation that would not damage the party’s reputation or my own. But that option was never allowed to me. The motive was contemptuously kept a secret and dialogue was shunned, even after I protested the Committee’s tone with scathing criticism before party members. There was no possible reason that I was not prepared to respectfully discuss or publicly debate. I subsequently emailed Mike Schreiner repeatedly to request that he ask the Nominations Committee for the reason for my rejection, as was in his power to do. He continuously ignored and then deflected my request. The party approved a last-minute paper candidate whose profile was lower than my 2015 candidacy and who missed both all-candidates meetings. After history-making election as an MPP, Schreiner hired the party’s Executive Director as his Chief of Staff. Schreiner may be perceived to have rewarded the inexplicable abrasiveness of the Executive Director towards me. Then in August, I was nominated by Green Party members to become a Deputy Leader Candidate for internal elections. Days after membership voting began in a contest in which I was plausibly going to win, the Executive Director led party authorities into kicking me out of the party within a secretive closed-door process excluding my input. While on Schreiner’s payroll, the Executive Director sealed the contest against my victory. The stated reasons for membership termination were that I “harassed” party authorities by protesting the manipulations regarding my attempted candidacy, and that I attempted as a Deputy Leader Candidate to attend an event where the Leader was present. It was demanded by GPO authorities that I not be present at this event, ostensibly to “protect” a complainant with a history of public negativity towards me during the course of a transparently-unprofessional and artificially-prolonged “investigation”. I now believe that the truth is that this demand was made because Schreiner himself was newly anxious to keep space between himself and myself, even without actually asking me for such. Why would Mike Schreiner and his peers persecute me first without explanation and then with an inflammatory explanation? In my years with the party Schreiner had been repeatedly encouraging to my face, such that I thought that he felt genuine respect for me. I did not see a menace in his inability to admit self-error or continuously debate over any of our many high-profile policy disagreements, but merely perceived his disagreements as disappointments to be overcome with more patient lobbying of the party membership. Certainly he never directly communicated with me any desire for my reduced participation in the party. I still believe that he is a phenomenal MPP for the riding of Guelph. But I now also believe that Schreiner was never prepared to come to terms with the potential of any victory on my part over our policy disagreements. He was never prepared to accept my rising-star status within the party, but also lacked the courage to admit that there was a problem. And his employee and peers, or “puppets” if you will, took silent cues and accordingly persecuted me with expectation of being rewarded with internal power and influence. At every stage of this conflict the GPO leadership recklessly defied the party’s core value of Participatory Democracy. At every step of the way the most consultation was not targeted at who was most affected, but instead at who already had the most power. At no point did GPO authorities attempt to show the humility necessary for two-sided learning. The hard-learned lesson of this experience is that no political party consistently practices Participatory Democracy, because the flaws of human nature get in the way of doing so. Humans sometimes desperately invest their self-esteem in given courses of action, and when confronted with criticism only become more desperate to dig in. It takes an especially courageous politician to show the openness and patience for opposing views as to be consistently courteous where two-sided consideration is due. When I had attempted to appeal to the GPO Ombuds Committee, an institution which later revealed itself to be controlled by the Executive Director, the Committee had made a telling claim that Participatory Democracy was a party value that could be compromised for the sake of “efficiency and expediency”. But that is a false proposition: political parties that humiliate their own supporters with inconsiderate disregard in the decisions at hand are parties that reserve themselves for special spots in electoral hell. Those are precisely the kinds of parties least likely to achieve growth. Indeed even as the GPO elected an MPP for the first time, its vote share was down from its 2007 peak of 8% to roughly 4.6% in 2018. I do not doubt in my mind that Mike Schreiner wishes for more Green MPPs to be elected alongside himself in the next election in 2022. If he could wave a magic wand to make it happen, he would choose to do so. And yet, he is sure to undermine that very goal with his perceived short-term need to retain control of the GPO at my expense and at the expense of others who disagree with him. He may make his constituents proud as an MPP, but so long as other like-minded MPPs are not elected alongside him, he will keep losing battles just as he currently does under Premier Doug Ford’s government. The point here is that to achieve true political success, one must be in keeping with the practice of both integrity and Participatory Democracy. One may potentially earn a salary or achieve short-term fame in the example set by Green Party leadership, but the only legacy that one can be proud of will be accomplished after long-term perseverance in being courteous and respectful towards opposing views. It will not be accomplished through spiting or alienating critics so that one may feel in more immediate control in the present. Sadly, the Green Party of Ontario under current leadership is not on track towards true long-term political success, because it does not live up to its own core promises even when in its long-term interest to do so. Stefan Klietsch was a dedicated Green Party of Ontario member from 2012 to 2018. He graduated with an Honours Bachelor of Political Science from the University of Ottawa, and currently studies Computer Programming at Algonquin College. 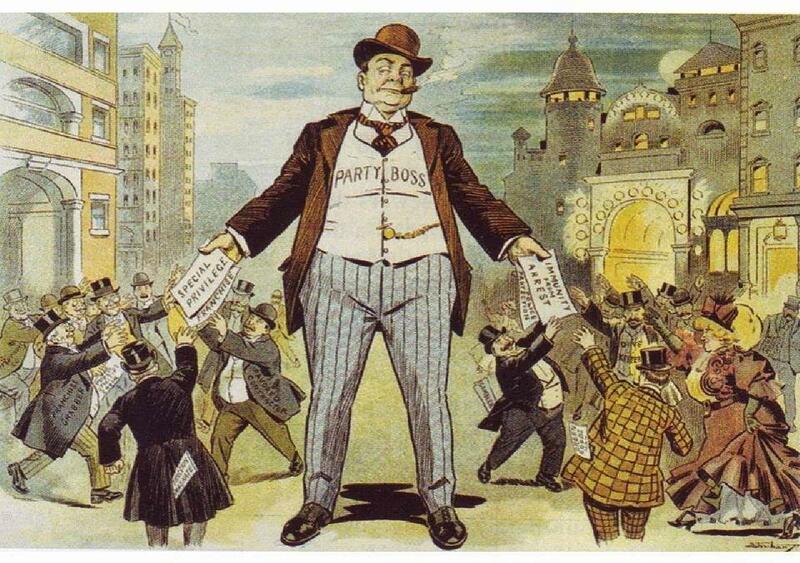 The photo shows a cartoon of political corruption by Thomas Nash, published ca. 1870s.